Japanese companies, Masahiro Minami Design and NIHON LOGIPACK Co.,Ltd. recently joined forces to bring the new fiberboard toy company TSUCHINOCO to life. 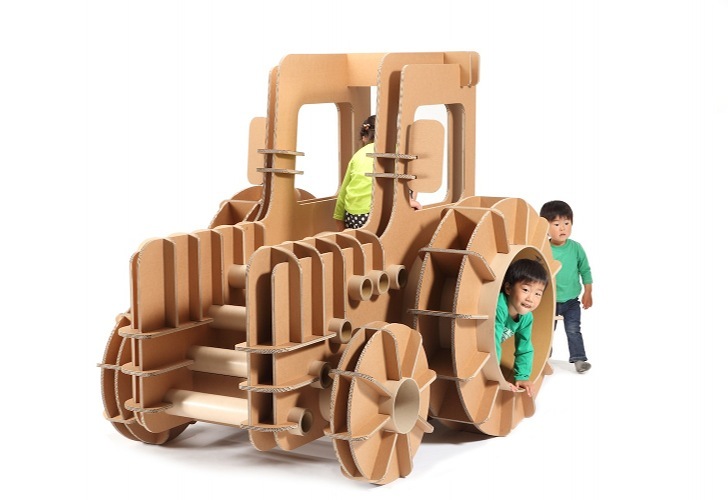 The eco-friendly corrugated fiberboard play structures elevate the unassuming material to entirely new heights in the play realm. 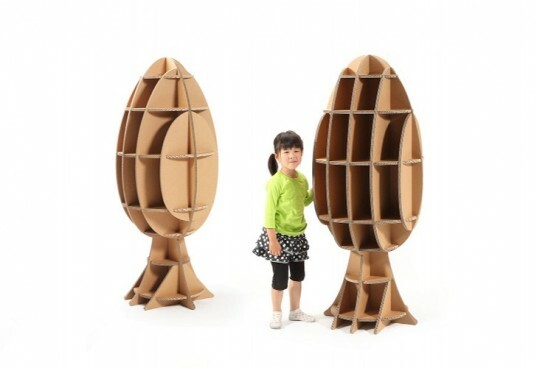 TSUCHINOCO is named after a Japanese legendary snake-like mythical creature, and these ingenius cardboard designs were created as a farm-village playground for the mysterious animal. Keep reading to behold their innovation in form and function. TSUCHINOCO equipment is made out of reinforced corrugated fibreboard called HIPLE-ACE which is known for it’s weather resistance. The material is as strong as wood, but only one-third to one-fourth of its weight. TSUCHINOCO toys are lightweight, so children will have no trouble interacting with or moving them around as necessary. Cardboard design has been rediscovered in the area ever since the Great East Japan earthquake and Tsunami in 2011. Many rescue teams built temporary housing, shelters, and furniture out of the corrugated materials. TSUCHINOCO toys are 100% recyclable, even after years of use. The amazing designs are life-size pieces that can be used for play, storing materials, and much more! We are impressed with the designers’ ability to take a flat material and not only make it 3D and life-size, but to make it functional and playful as well. TSUCHINOCO play structures can be used outdoors, in schools or at home, making it a versatile option for eco entertainment for little ones. The amazing designs are life size pieces that can be used for play, storing materials, and much more! HIPLE-ACE is used for heavy cargo instead of wooden packing boxes. The material is as strong as wood, but 1/3 to 1/4 its weight. The TSUCHINOCO toys are light weight and a child could even lift the stool to move around. The TSUCHINOCO toys are 100% recyclable, even after years of use. TSUCHINOCO equipment is made out of reinforced corrugated fibreboard called HIPLE-ACE which is known for it's weather resistance. We are impressed with the designers' ability to take a flat material and not only make it 3D and life-size, but to make it functional and playful as well. TSUCHINOCO playground equipment can be used outdoors, in schools, at home, and any other large play area.